Our partners at Skipton Tennis have entered into an exciting new arrangement with Craven College and North Yorkshire Sport. The agreement will help young BTEC students develop their coaching skills, up-skill primary school teachers and give primary school children (years 3-6) the chance to take part in tennis activities. This new agreement is a continuation of the great work Skipton Tennis do in our community and we are delighted to be able to support them. 20 college students will be given the opportunity to take part in a tennis leaders course when the programme starts on February 11th. 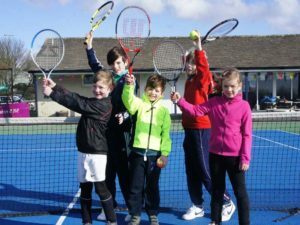 The course will be delivered by Skipton Tennis coaches and will aim to provide the students with the skills required to deliver small supervised school based programmes. The number of primary school competitions organised annually by the club will also increase to 5 and local schools will stand to benefit from increased support in PE sessions. The club are always looking at new and innovative ways to bring tennis to as many children as possible across the Craven area. For more information on the many programmes Skipton Tennis Centre run, please contact Head Coach – Adam Cox via [email protected] or 01756 796655.